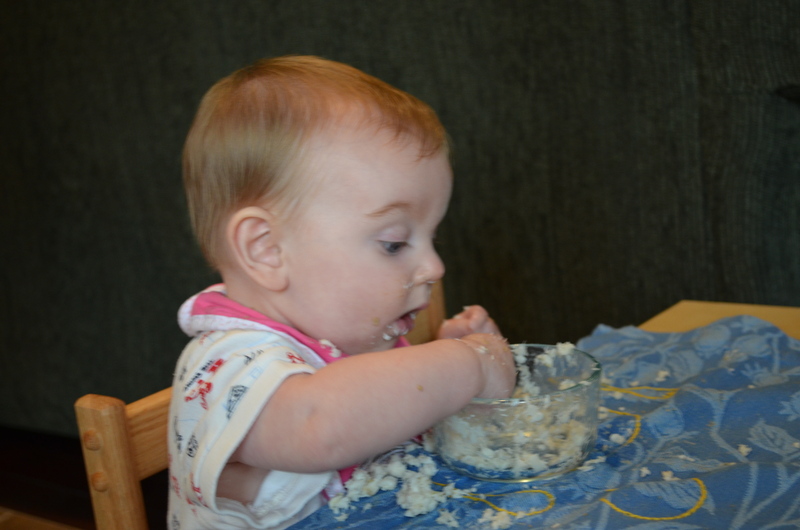 Montessori lingo calls the introduction of solid foods “weaning” so I’ll refer to it as weaning. Confusing as when I mention this to others they think I’m cutting A. off of breast milk. Definitely not the case. We’re just starting with foods other than breast milk. I don’t know when the completion of weaning will take place, but I’ll share with you the start of weaning. How did you decide when and what to first feed your child? Or is this decision still ahead of you? I took a long time to decide what to do. I love the Montessori approach to first introducing foods! 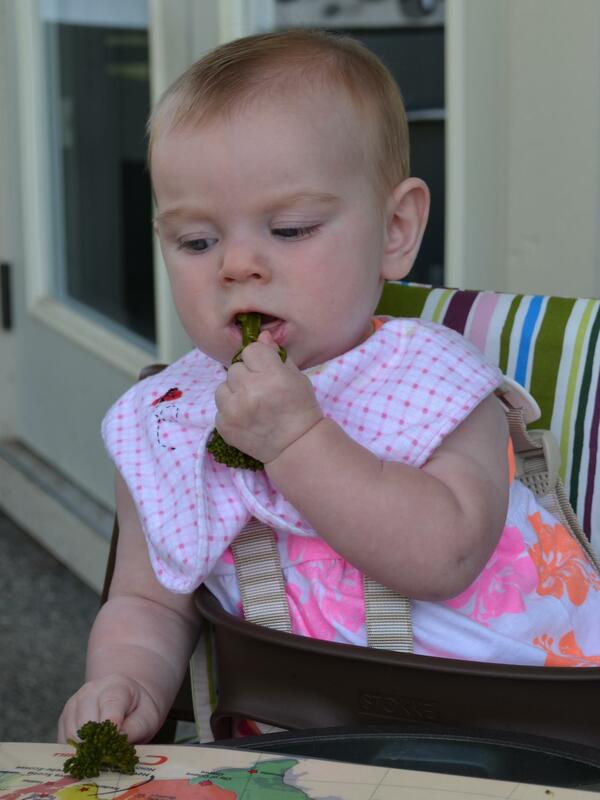 The pre-weaning was such a success that I wanted to continue following the Montessori philosophy. 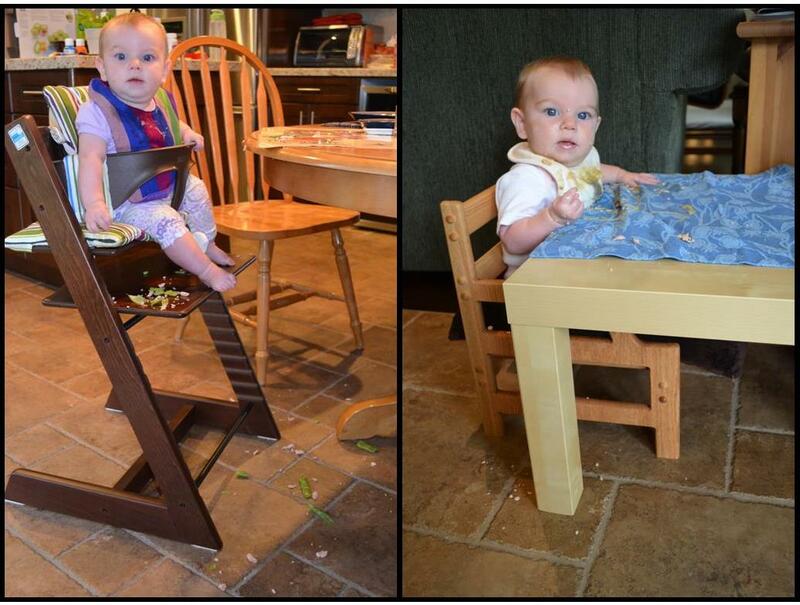 I was also attracted to “Baby Led Weaning” (BLW) which seems to be quite popular in Montessori circles. Kylie has done a comparison that is often referred to as it well written. After thoroughly reading my albums, “Understanding the Human Being“, “Baby Led Weaning“, and whatever else I could find on the internet, I decided to do both approaches. I had prepared A. for both approaches by offering her the pre-weaning juices seated at her weaning chair and table after her morning nap and by offering her the pre-weaning juices and fish pâté seated in her high chair during our family dinner time. The Montessori approach is to have the weaning chair and table in the child’s room (or wherever your usual location for nursing your baby is) but I skipped this as I figured I’d already helped her make this psychological step by first starting the pre-weaning juices in the nursing chair and changing that to her future eating locations. With the exception of teeth, A. showed all these signs. Anybody eating around A. in the weeks prior could definitely attest to how interested in eating she was! By observing her signs I knew when she was ready for it, which helped me fully embrace this new step. 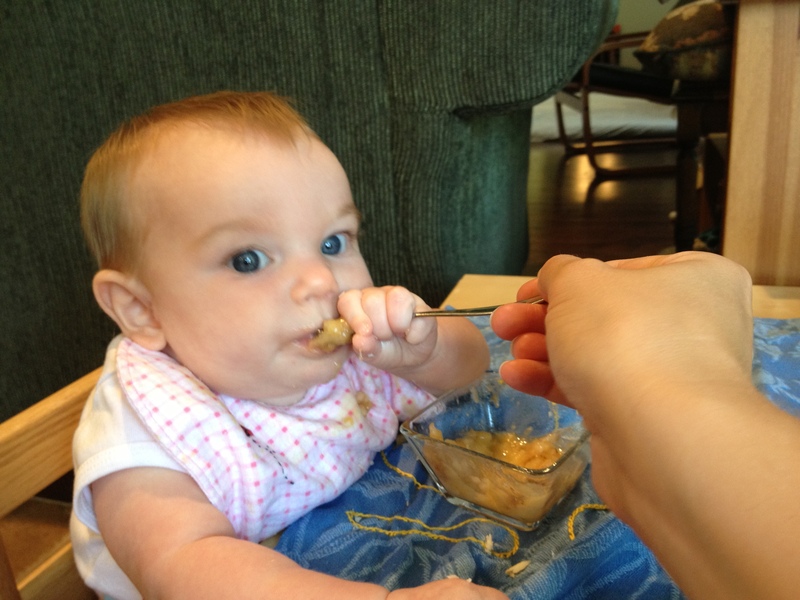 It is an important psychological step away from Mom to embrace solid foods. I also prepared in practical ways by obtaining small dishes, spoons, and forks. 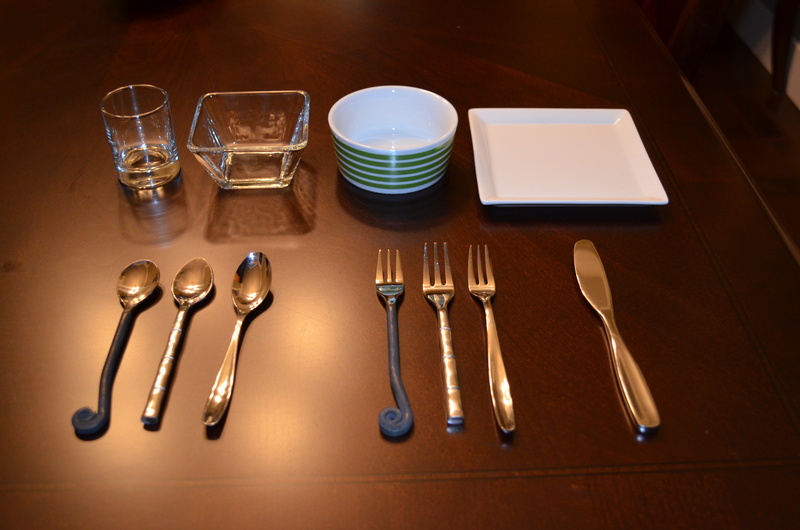 The dishes are breakable and the flatware is stainless steel, just like what we use. One of my Montessori trainers (instructors) gave me the tip to try to find clear dishes with sides so the child can stop the spoon at the edge and lift up the spoon instead of scraping the spoon up and off the side of a curved dish. We went to World Market and this is what we came up with. I already had a special place mat that I made for her during my training and we had many bibs given to us as gifts. I went out and bought her beautiful flowers and placed them in a special vase. We waited until Saturday when Daddy was home from work. I prepared her rice cereal, fish pâté, and puréed apple. The Montessori approach is to prepare cream of rice (or semolina) cooked in vegetable broth, or rice cereal with a bit of tomato and parmesan for flavour (Stephanie has done a great write-up of how to make the rice dish) but I was unable to find cream of rice or rice cereal so I opted to do the common approach of baby rice cereal mixed with breast milk. The fish pâté and apple were foods she had already been introduced to so I knew she did not have any allergies. I was excited that I was able to offer her a full meal for her first weaning meal, not simply bland rice cereal or one puréed food. Not her first meal as I was so excited to offer it to her that I forgot to take a photo but this is from later in the week. The ramekins are the serving dishes and the small square dishes (stacked up) are the eating dishes. Bib goes on, hands are washed with the cloth and food is offered. 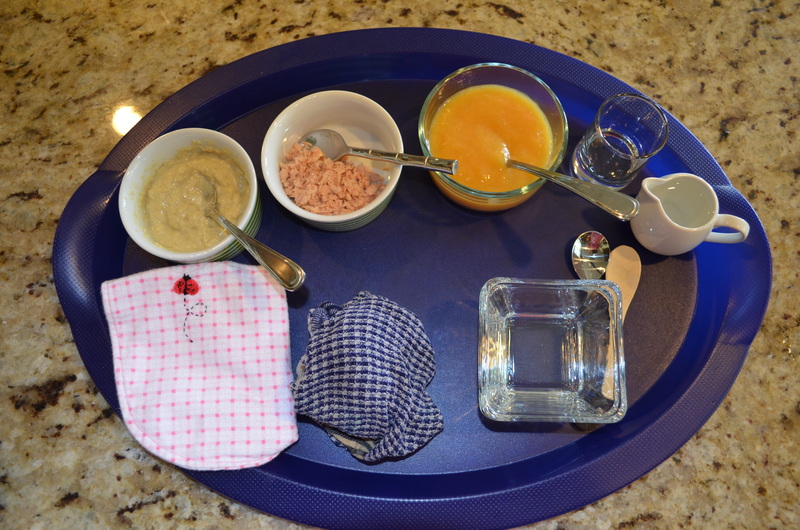 First course is rice cereal mixed with breast milk, second course is fish (salmon here but sole was her first meal), and third course is fruit or vegetable purée (here is it peach but apple was for her first meal). We wrap up the meal with some water. 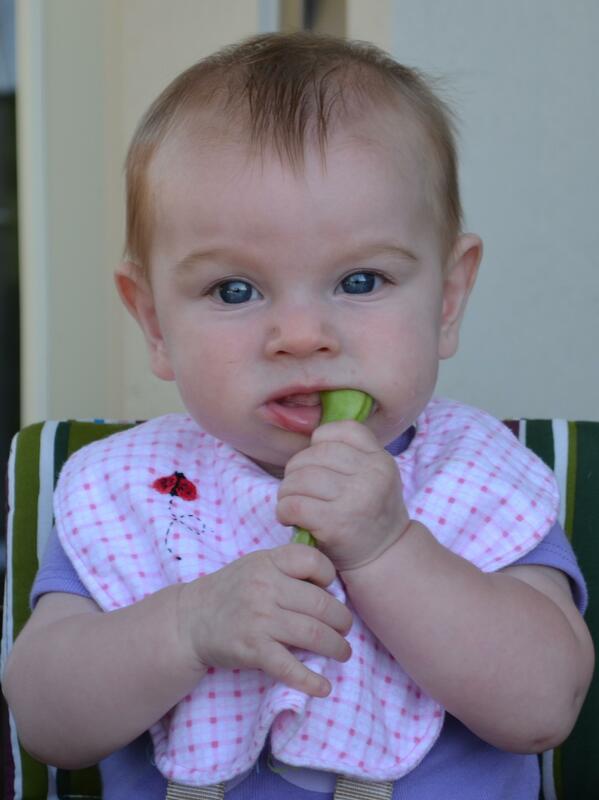 Weaning – a true celebration day! Weaning Day had arrived! She was a week shy of 6 months. After she woke up from her morning nap I dressed her in a pretty dress and approached her first meal as a real celebration! In honesty, I wasn’t expecting much other than a few tastes of each food. Instead she completely surprised me and took an hour enjoying it all! 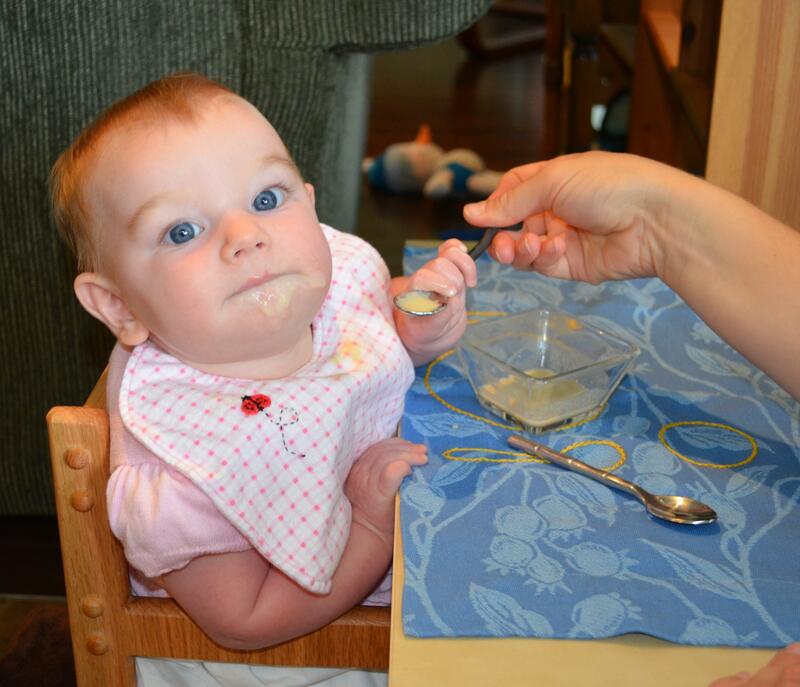 She enjoyed the experience of sitting at her special weaning table and chair and eating food from the spoon. She enjoyed grabbing the spoon with each bite. She enjoyed dipping her fingers into each dish of food. She enjoyed being distracted with the second spoon, covering it in food too. (For future meals I ditched the second spoon as she was only distracted by it and was self-feeding by grabbing the one spoon for each bite.) She enjoyed each of the foods I prepared for her. She enjoyed being introduced to the little glass and drinking water from it. I couldn’t believe how much she had enjoyed it all and how long it took! She was so focused on each new part of the whole experience. I made sure to approach each spoonful as something I was offering and not feeding her. I started the first few spoonfuls with the tiny pre-weaning spoon and then introduced her to the weaning spoon. She didn’t eat a lot that day but a decent amount, definitely much more than I was expecting. Afterwards I offered her breast milk as usual. We have continued in this manner since then and she has only approached food with more gusto. She will often feed herself mashed fish using her hands, making a real mess. For cereals and mashed/puréed fruit or vegetable she will grab the spoon and bring it to her mouth demonstrating keen interest in almost all foods. She is gaining a greater ability to use the glass independently everyday but really struggled with it at first as her wrists could not make the rotation necessary to tip the glass. I tipped it for her for the first few weeks. I often use small pyrex dishes instead of the ramekins as serving dishes as whatever she doesn’t eat one day can easily have a lid put on and saved until tomorrow. As she is eating more, I will sometimes also use the ramekins as eating dishes. So along with her “meal” after her morning nap (which has turned into lunch time) I decided to do some BLW at dinner. We started with steamed bean and roasted carrot (again she had been introduced to these through pre-weaning juices) and introduced her to steamed broccoli. These were all vegetables that we had grown in our garden. The BLW book indicated that babies mostly play with the food for the first few months so I didn’t approach this with such excitement, more in a casual way. Before we started with food, she was sitting at the table with us in her Tripp Trapp high chair playing with toys. So instead we gave her food to play with. Well, it didn’t take long for her to catch onto really eating the food. She absolutely loved feeling the textures of each food and eating. She especially loved the salmon and chicken. It hasn’t been easy when she gags on the foods. I’m poised on the edge of my seat ready to whip her out of her chair and whack her on the back, thankful for my first aid training. I decided not to use the straps as I figured I wouldn’t want to be fussing with the straps in a state of emergency. Of course I’ve never had to do that. I try to be calm and encourage her to keep coughing. So far she’s always been able to cough it up, no matter how big or small the piece is. It seems to me the first time she has a food she tends to gag on it a little more. She has also gagged less and less as she learns to eat. I decided to use plates and dishes for her at dinner time, along with a fork as this seemed more Montessori to me: treating the baby the same as us. There have been a couple of broken plates but no broken glasses so far, although I’m sure there will be in the future. The wrist and hand development that occurs while taking a slice of peach out of a dish or figuring out how to hold the chicken drumstick is amazing! She finishes each meal with some water, giving her the opportunity to develop this skill twice a day. 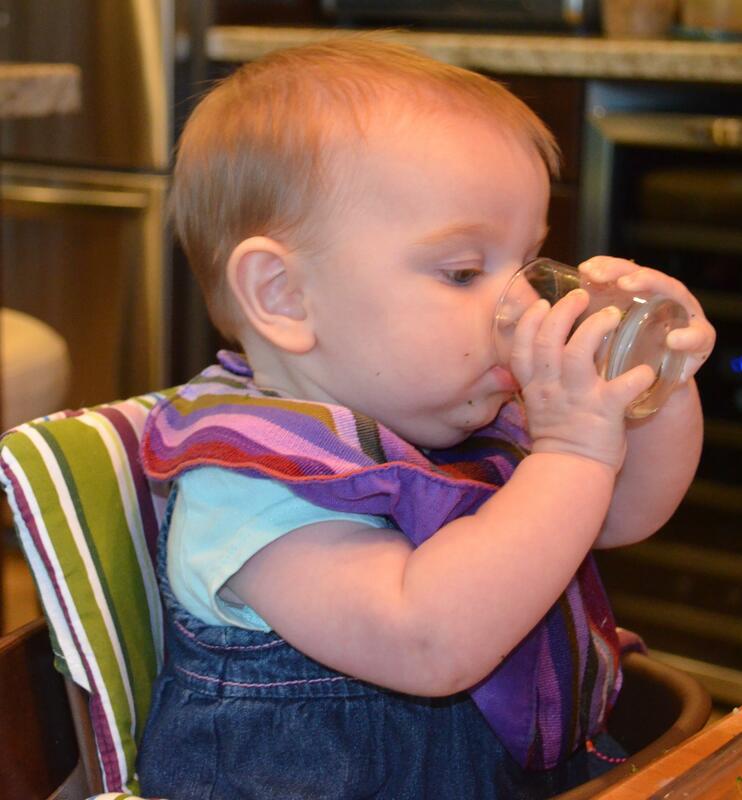 She is now able to pick up the glass and drink from it but is definitely still learning as she will miss her mouth sometimes and sometimes tip too much and cough on the water. I continue to be amazed at her progress in such as short period of time. I’m really happy with how things are going. It’s been about a month and despite the huge amount of work it has been planning and preparing for all these new meals, A.’s enjoyment of it all makes it completely worthwhile. There have also been huge changes to sleep (through the night) and poo (in the potty). When and how to cut back on breast milk was my other dilemma. A. has done this herself by increasing sleep through the night and taking longer naps. Each of the meals usually takes at least half an hour, so more time is spent eating in general. It has all unfolded pretty naturally. Now, if only it could all be done with a little less mess!